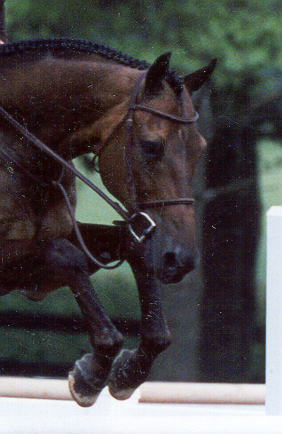 A standing martingale has a long strap running from the girth to the noseband. It acts on the nose, not on the horse’s mouth, and limits how high he can raise his head. A standing martingale should be adjusted so that when the horse’s head is in a normal position, the martingale strap can be pushed up to touch the horse’s throat. 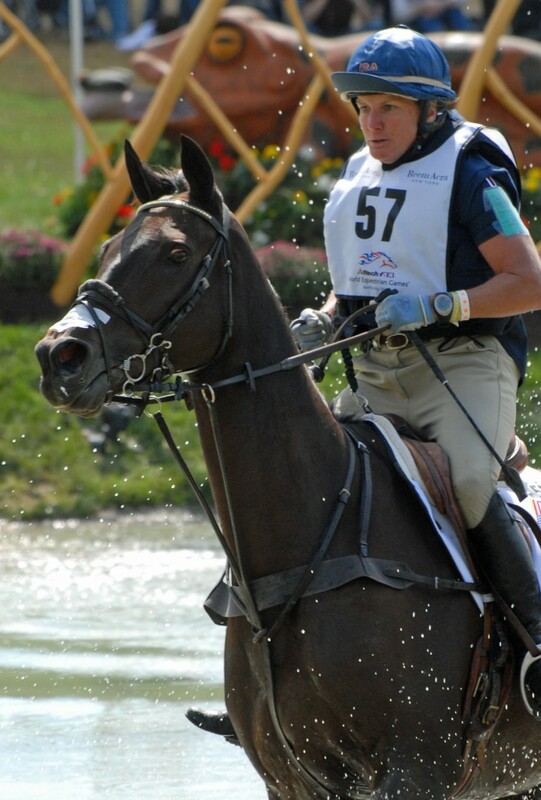 It should be attached to the cavesson noseband, never to a dropped noseband or flash strap. There are rules about when a standing martingale can be used, so check the current USPC Rules for Competition for each discipline to determine if a standing martingale is permitted in that discipline. A running martingale with a combination bit and a flash noseband. A running martingale has a Y-shaped strap running up from the girth with rings at the ends for the reins to pass through. When the horse raises his head, the running martingale pulls downward on the reins and acts on the bars of the horse’s mouth. 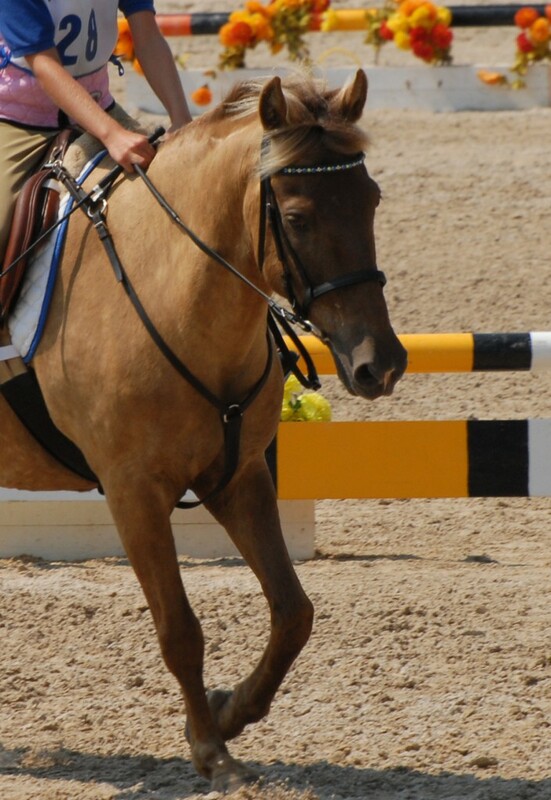 A running martingale must always be used with rein stops. 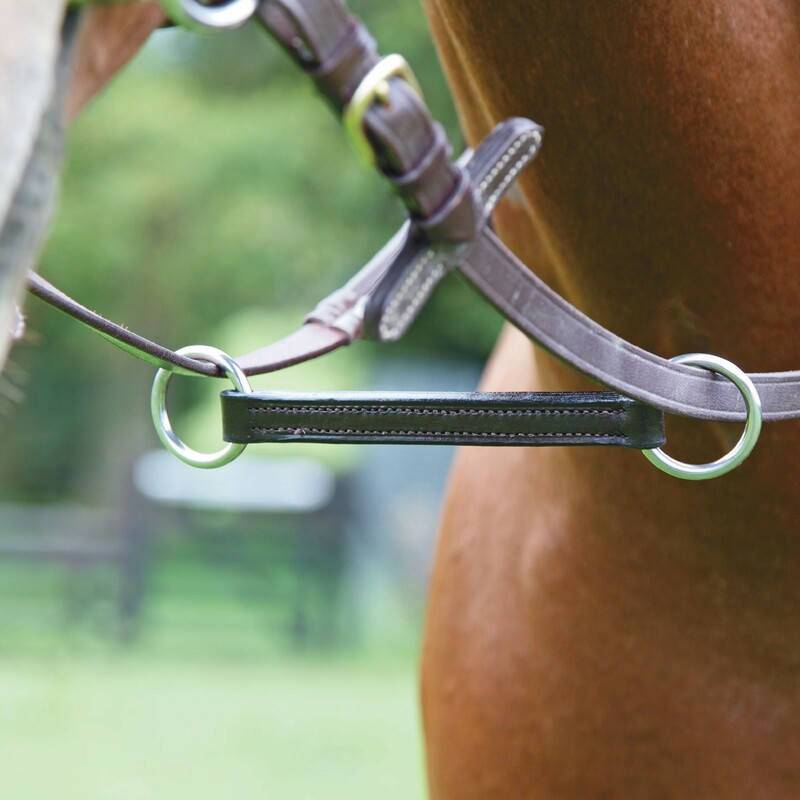 These are placed on the reins close to the bit to prevent the martingale rings from becoming caught on the rein fastenings, bit cheeks, or the corner teeth – this is an important safety measure. A running martingale should be adjusted so that there is one or two inches of slack when the horse’s head is in a normal position, and the reins make a straight line to the rider’s hands. 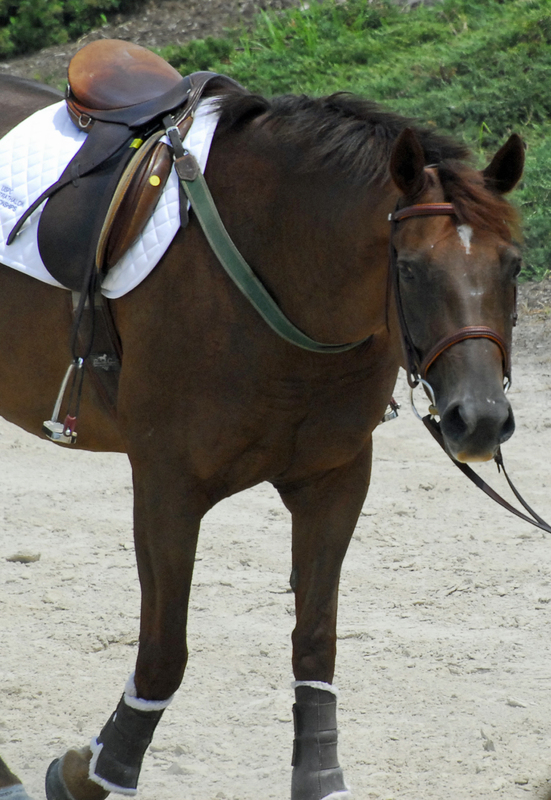 Another way to check the adjustment is to pull both martingale straps (without the reins) up to one side of the withers. Irish martingales are traditionally only seen in racing. It is the simplest of all martingales – a single strap of leather with a ring on each end that slides over the reins much like a running martingale. 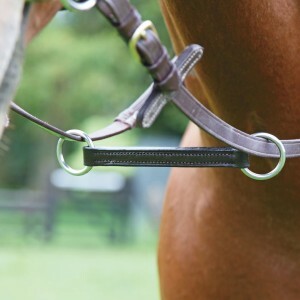 Rein stops must be used with this martingale to prevent the rings from hanging on the bit, rein fastenings, or corner teeth. This martingale prevents the reins from flying over the horse’s head should he happen to stumble or lose contact with his rider. A breastplate keeps the saddle from slipping back. The yoke fits around the shoulders, and the center strap goes between the front legs and fastens around the girth. The two tops straps attach to the Dee rings at the front of the saddle. There should be room to fit one hand at the top of the yoke, and the center strap should be slightly loose so it will not cause a sore between the horse’s front legs. The best breastplates have adjustable buckles on each side of the yoke. 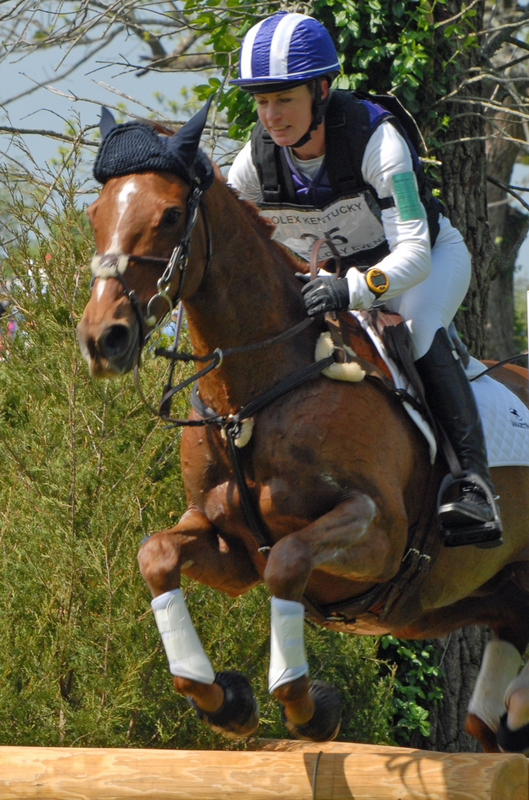 An event or polo style breast collar. A breast collar keeps the saddle from sliding back. It should fit across the chest without binding at the base of the neck. It is buckled around the girth on both sides and runs across the horse’s chest. The upper strap, which passes over the horse’s withers, should be snug enough to keep the breast collar from slipping down. A 5-Point breastplate with running martingale attachment. A combination of a breastplate and a breast collar, with padding at the key pressure points. It has extra security but allows free movement of the shoulders for jumping.